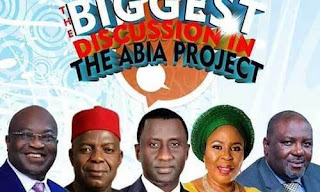 Four persons have been injured with property worth thousands of Naira destroyed at the Famous Abia Hotel located on Finbarrs road, Umuahia, venue for the Abia state Governorship Debate, organised by the 2019 Abia state Election Debate Team. The students who took to violence, destroying chairs, doors and windows at the conference hall where the debate was held, blasted the governor of the state, Dr. Okezie Ikpeazu, for neglecting and refusing to address them (the Abia students). One of the students who would not want his name mentioned, said the students under the aegis of National Association of Abia state Students (NAAS), came to witness the debate, after which they expected the governor to address and give them money for transportation, saying the reverse was the case. He added that in their bid to get the governor's attention, his security men pounced on the Abia state president of NAAS, Nwazuo Remijius and others, leaving them injured. According to a witness, the security aides of the governor opened fire and threw teargas to disperse the students who have already barricaded the road, closed the hotel gates to stop the governor from leaving the premises. A Senior Special Assistant to the governor on Grassroot Mobilization and Political Matters, Hon. Ugwumba Adiele, said the students acted very fast, stating that the governor had already mapped out money for them while he was rushing to Owerri for the South East PDP Presidential rally. He condemned the attack on the governor, maintaining that giving of money should not be under compulsion but freewill.